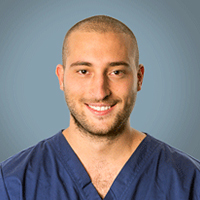 During the last year of University, Claudio completed a 3-month externship at the University Small Animal Hospital of Cordoba and spent 2 months in an orthopaedic referral centre in Belgium. He graduated in Milan in March 2015 and after a brief experience Laos, he started 1-year private internship in the south of France. He moved to the UK in October 2016 and after 6 months working in a busy first opinion hospital in Norfolk, he joined SCVS. In the future he would like to undertake a surgery residency.